Full integration with your POS system, simple yet powerful ordering interfaces, a $20,000 Additional Revenue Guarantee, advanced delivery mapping, exclusive features like “My Way” to remember customers’ order specifics, and enthusiastic customer service at Online Orders Now are just a few of the many reasons why restaurants make the change to add an online ordering system. 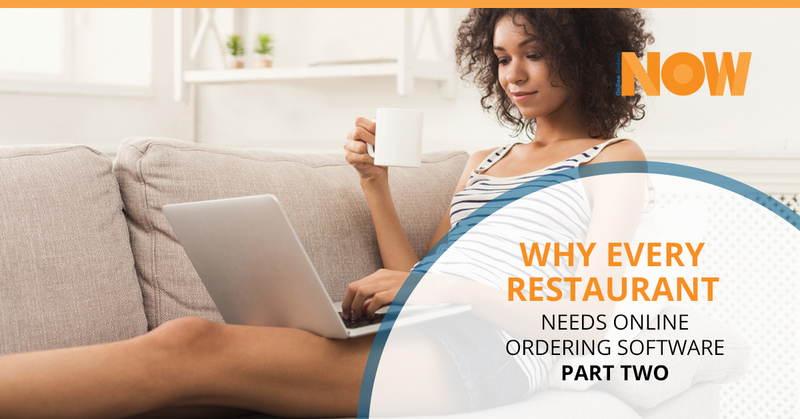 This is part two of a two-part series designed to highlight the many benefits and features that Online Orders Now has to offer restaurants of all kinds. From a broad-strokes perspective, every product we offer is designed to improve your ROI while not making your life any more difficult. In fact, having an online ordering system that directly integrates with your POS system is arguably like having an invisible cashier who never makes a mistake. Of course, there is so much more in terms of features and benefits that go into what sets Online Orders Now apart from other providers of online ordering software. To touch on part one just briefly, perhaps the most important two features we discussed are seamless integration with POS systems (in addition to semi-integration and non-integration, which we also offer) along with an average of 30 percent larger tickets. To speak to that last point, it’s a verifiable fact that consumers spend up to 30 percent more when ordering online as opposed to ordering over the phone or the counter. It doesn’t take too much thought to realize what kind of impact that can have on your bottom line over the course of a year or two. What’s more, Online Orders Now doesn’t take a cut on individual orders like many of our competitors do. We offer an affordable monthly fee — however much you make on your online orders is yours to keep! That’s the way it should be, too. Now that we’ve addressed some of the big picture features, we’d like to take the rest of today’s post to highlight more unique features that we have included in our online ordering software. We at Online Orders Now are innovators in this industry, and we have been for over a decade now. Below you’ll find out why so many restaurant owners make the decision to choose us as their providers — and end up being thrilled with the outcome! Discounts, Combos, Packages, And Special Offers – When it comes to discounts, you can select either a dollar amount or a percentage off of the entire order. You have the control as we have designed our software for restaurants to have the option of being coded. It can also require a minimum amount purchased before the order becomes eligible for a specific discount. You can also restrict the discount (or special offer, combo, or package) to only be active for certain days and time. So if Mondays and Tuesdays are your slow days, you can experiment with a variety of discounts or special offers to help alleviate that issue! As if all that weren’t enough, we’ve made it customizable to the point where you can restrict your offering for takeout or delivery only, set a minimum purchase amount, allow for only one of the same package to be added to your shopping cart. A few common examples many restaurants like to use, that we are sure you are familiar with as well, include “Buy One Get One” and single menu items that groups several menu items together for expedited ordering. Automatic Upselling Suggestions – You can increase your ticket sales by up to 40 percent if things go the right way. And a big contributor to that happening is our automatic upselling suggestions feature. You are able to specify which menu items are suggested based on the customer’s choices, meaning our mobile ordering system for restaurants goes well beyond asking the customer if they “want to add dessert” to their order. You know your food and customers better than we ever could, so we’ve given you the tools to put together perfect pairings based on what the customer has initially entered for their order. Plus, our system is easy to use, so don’t worry about stressing out on the setup portion! Reduced Credit Card Fees – Online Orders Now is completely certified and backed by a strong number of Authorized Merchant Service Providers. Among the growing number are Aldelo EDC, Authorize.net, Sterling Payment, Mercury Payment Systems, and Pay Pros. The bottom line is that using our merchant payment partners will save you on ecommerce gateway fees. Every little bit helps! Administration Back End – This aspect might be a bit more technical, but bear with us for a moment. Our administration back end lets you turn on/off the online ordering from anywhere and at any time. When this happens, a message is automatically generated for customers who are trying to order online. The message will inform them that they can call in to place an order or simply come to the restaurant and dine-in, depending on your preference. There might be times when you are short staffed and can’t handle a wealth of online orders coming through because your dine-in customers are already waiting too long for their food. Hey, it happens, and it’s never a bad thing if business is so good you need to start thinking about hiring a few more employees! What’s more, our administration back end affords our clients the ability to make real-time changes in our full-featured administrative web interface. This means you can change item descriptions, delivery times, pricing, and make updates based on your needs regarding holidays, vacations, etc. Of course, if you are too busy managing your restaurant to do this, all you need to do is get in touch with our helpful support staff and we can make those changes for you with no trouble! First-Time Customers Sent To Your Email – This point isn’t nearly as involved as those listed above; every time you get a new customer, an email address of your choosing will get an email. This can be invaluable for marketing purposes — a point we’ll touch on below. Marketing Information – As part of our dedication to improving your restaurant’s marketing efforts, we record all customer info that they provide while filling out an online order. The required fields are name, address, and zip, but you can add additional fields as well. Plus, if you have an integrated menu, all customer data received is automatically pushed to your POS with each and every order. If not, you can access all of this information in the Admin. And if that sounds like too much trouble, just email us at CS@onlineordersnow.com and we can email it to you in Excel format! No Failed Orders Due To Internet – Our restaurant ordering software includes the feature of making sure that all orders go to fax/email/text notification so that you never miss an order if your POS or internet happens to go down. Order accuracy means happy customers! Tips Allowed – Customers can tip right on the menu, with a default setting of 15 percent. When customers are paying with credit cards, this can be very helpful! Naturally, we’ve set up this feature to be customizable, in case you want to offer different percentages based on your preference. Advanced Ordering – It’s a pretty sweet setting, if we are being completely honest. You can allow customers to place an order now for pickup or delivery later. This is a great way to help your kitchen not make mistakes, while also being great for customers who want to take care of placing an order at their own convenience! The more features that make your customers’ lives easier, the better. As we hope you can tell, you aren’t likely to find another online ordering system provider that is this serious about what we offer our clients. If you are ready to get started, contact Online Orders Now! We’d love to hear from you.